Does anyone here live in a REAL farmhouse? I sure don’t… I’m a city girl now. But I grew up in a real life farmhouse! I’m glad now to have modern conveniences but I still love farmhouse kitchen decor and I’ve found some budget buys to share with you today. These are from Amazon and Etsy, my two favorite places to shop online. 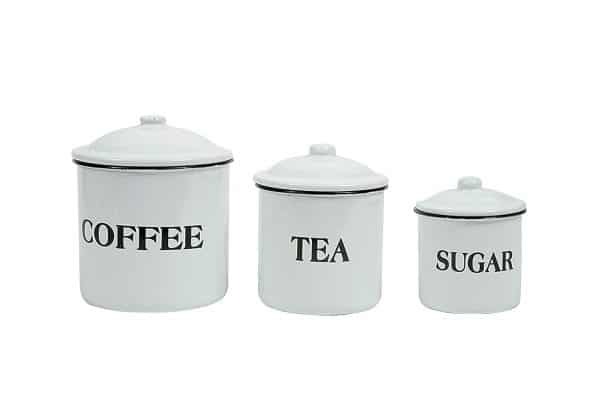 Coffee, Tea, and Sugar Enamel Canister Set – It’s really hard to find a complete canister set at flea markets. Plus sometimes they’re pretty dirty. I feel safer buying a new set. 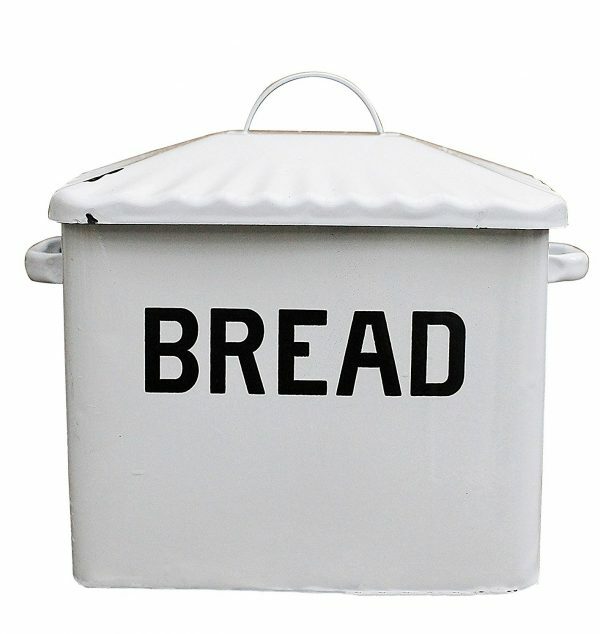 Enamel Metal Bread Box — Here’s the matching bread box to the canister set above. Farmhouse kitchens don’t need everything to match but a couple of pieces would be fine. Drying Stand for Cups and Glasses — These get really pricy in antique shops! 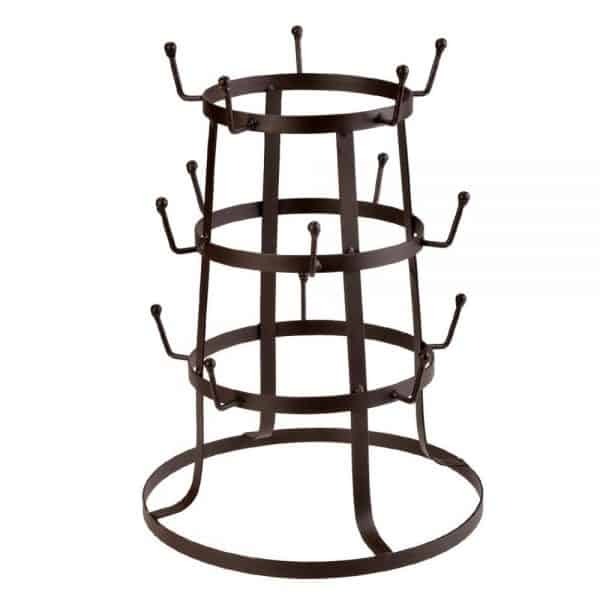 Use these for their original purpose of drying cups and glasses, or organize your coffee mugs and display them on your kitchen island or table centerpiece. This stand is my favorite because I have a small kitchen and it takes up less room. 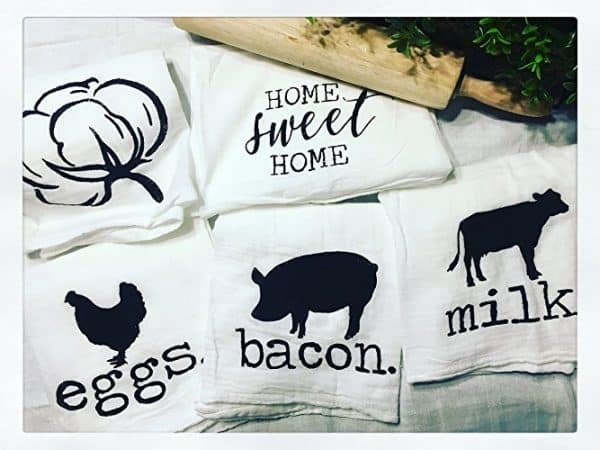 Farmhouse Style Kitchen Towels — This set is one of my favorites! I love the farm animal outlines. 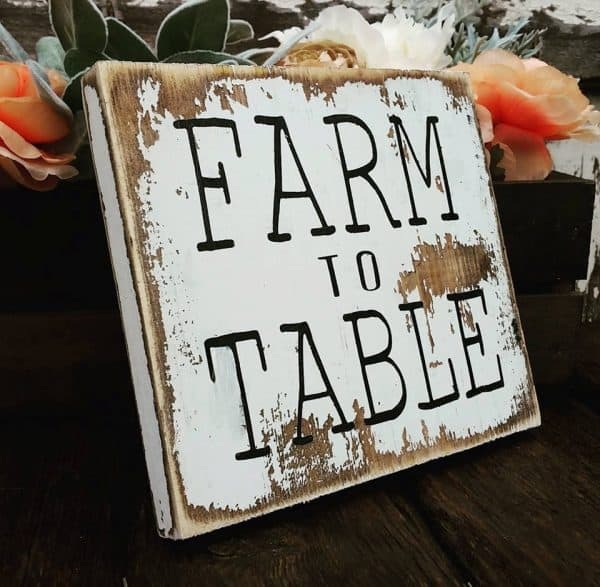 Farm to Table Handpainted Sign — I made one for my small kitchen/dining area but if you don’t want to make one you can find a lot of gorgeous hand painted farmhouse signs on both Etsy and Amazon. 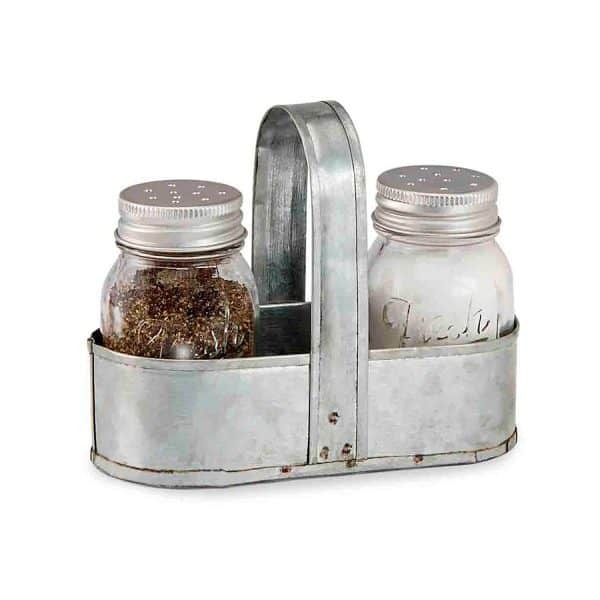 Galvanized Metal Salt and Pepper Caddy Set — Every farmhouse style kitchen needs a little galvanized tin! 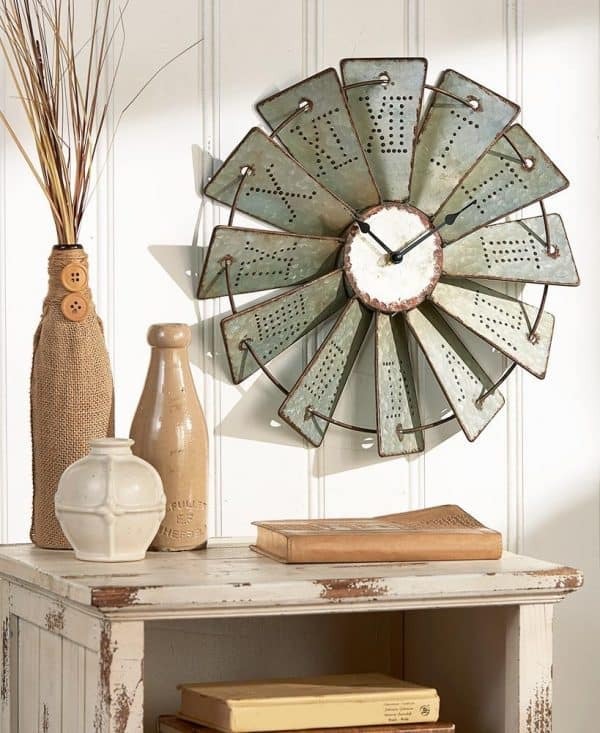 Metal Windmill Wall Clock — This is still my all time favorite clock! I have mine in the bedroom right now. (Next to my $1 cow painting!) But it would look great in a farmhouse kitchen, too. 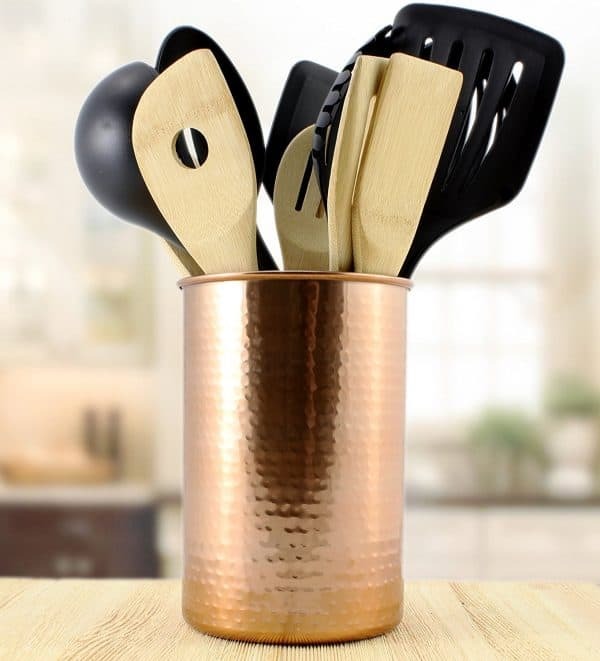 Copper Utensil Holder — Mix those metals!!! I do it with jewelry all the time. Now in my kitchen, too. Copper is hot right now and you can add some without changing all the metal in the whole room. Vintage Scale Reproduction — I love vintage scales but they’re another thing that can get really pricey in antique shops! 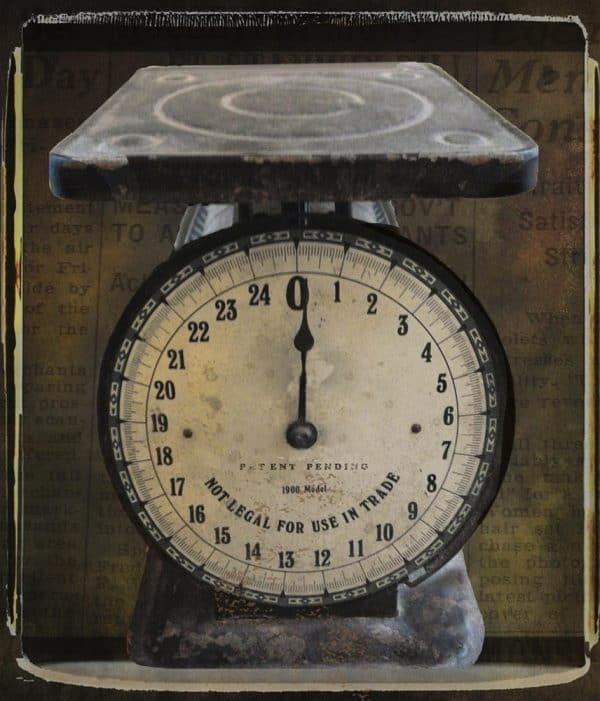 Vintage Scale Print – If you can’t find a scale you like or can afford, or if you don’t have the room, this print might be a good option for you. 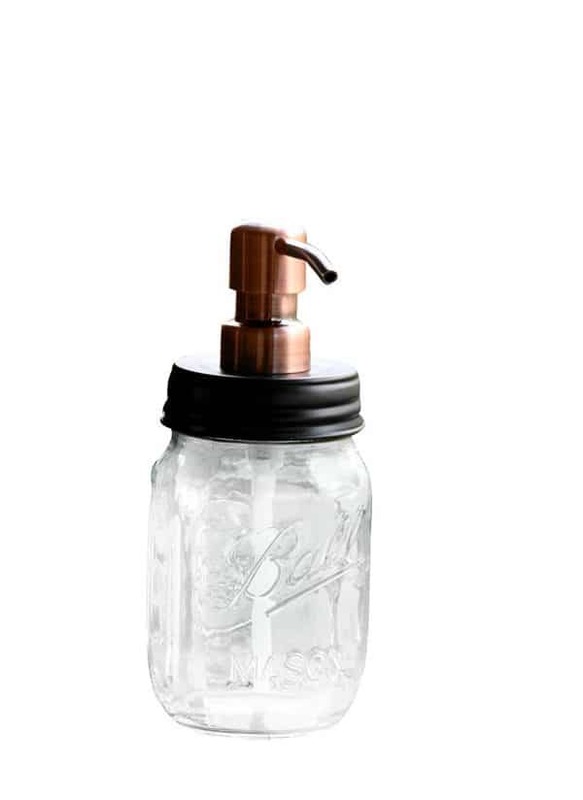 Mason Jar Soap Dispenser – Buy one or make your own with a kit and your own mason jar! Chicken Egg Basket — This takes me back to when I was a girl. We always had a wire basket hanging by the back door to gather eggs! This chicken basket is my favorite. White Ceramic Pitcher – Every farmhouse kitchen needs one of these for flower arrangements… or maybe even using it the way it was intended! Thanks for reading. Leave a comment and let me know your favorite farmhouse kitchen decor find! « Vitek’s BBQ, Best Barbeque Restaurant in Waco, Texas? Though I’ve lived in one in the past and would love to one day in the future! 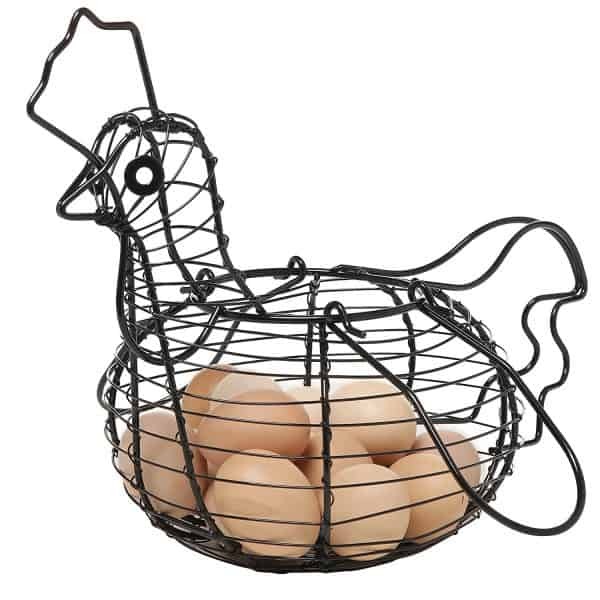 Love that chicken egg holder. Such an amazing post. I love the list. Thanks for such an interesting post. I was searching for some of kitchen decor tips to improve my kitchen and I found this post so useful. Great work!